The components used within jABC are called SIBs (Service Independent Building Blocks). The SIBs are presented in a structured view to the user called the SIB taxonomy. SIB represent the vertices of the jABC graph model. The directed edges are called branches. Multiple branches can be attached to a single edge to reduce parallel edges. The implementation of a SIB component for the system is the task of the SIB expert. The collection of the SIB components is fundamental for the jABC system. On the other hand this is the essential difference to all previous versions of ABC systems. jABC consolidates the different computer languages for the description of a component in older ABC version to a single language: Java! In jABC a SIB is a simple Java class implementing a quite simple interface. The class file summarise all abstract implementions of a component including the real world implementation for this SIB. 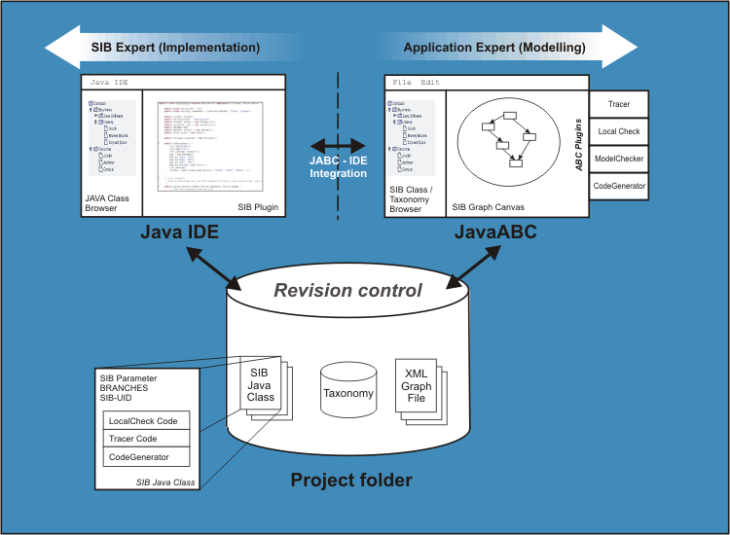 The task of the SIB expert is to implement the SIB Java classes. Technically every compiler can be used to produce these Java classes. The selection of a development environment can be freely done by each SIB expert on his own. It is not necessary that all SIB experts use the same development environment. With IDEs like Eclipse a close integration with the jABC guarantees a quick and simple creation of new modeling components. The central communication server in the jABC system is any Revision Control System like CVS or SVN. The RCS server supplies all elements of a project to the different participants of a project. The rights and role management of the RCS system controls the availability of different files to the project users. Additionally any file needed for the project (but not especially for the jABC) can and should be stored in the RCS Only by maintaining such a centralized versioning system guarantees to extract consistent snapshots of older versions of a project or model. In principle almost every versioning system can be used as the central communication server in the jABC system. We currently use Subversion because it is widely known and it is supported by the other tools of the project like Netbeans or Eclipse.